Original 6th plate daguerreotype, excellent portrait of an armed soldier holding a sword. Gold painted accents on sword and uniform. In the bottom-right along the edge you can just make out his military hat, a shako, I think, which has crossed sabers insignia and what looks like a "D", mirrored. When I removed the frame to clean the glass I saw another painted gold emblem right above the sabers, but it's hidden by the mat in normal viewing. There is not much detail to the hat but the three painted gold insignia pieces are obvious. Swipes, small abrasions, and light scratches, as shown, but a striking military daguerreotype. Behind glass and mat in full case, covers split along the spine. The original seals are inside the case. Rare unusual history south america american photography photograph picture antique vintage 1800s ethnic china japan asia chinese japanese. 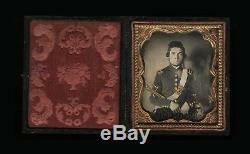 The item "Daguerreotype Photo Armed Soldier w Sword Shako / Civil War or Mexican American" is in sale since Friday, June 1, 2018. This item is in the category "Collectibles\Photographic Images\Vintage & Antique (Pre-1940)\Daguerreotypes". The seller is "jack_mord" and is located in Woodinville, Washington.